Each Good Friday our church hosts a Prayer Walk, that is very much family friendly. 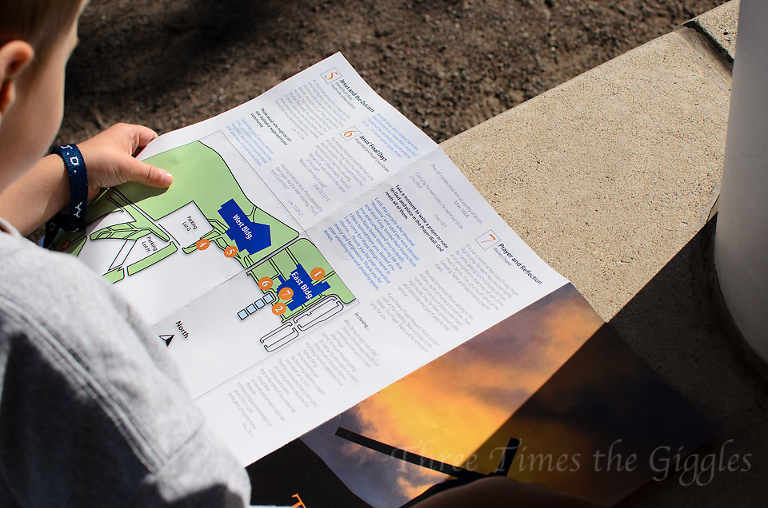 There are maps and prayer guides for the adults and a small prayer guide for children. The child-friendly prayer guide was a series of cards with pictures of suggested people/things to pray for at each of the 7 stations. Here’s a little video from one of the stations. The boys’ suggested prayer topic was pets, and considering we don’t have any pets, the boys chose to pray for the neighbor’s cat! The boys call the cat Gnocchi (after the cat in Curious George), but when they say Gnocchi, it comes out more like “milky”. Some of the other prayers the boys said were adorable, and I wish I’d thought to record more of them! 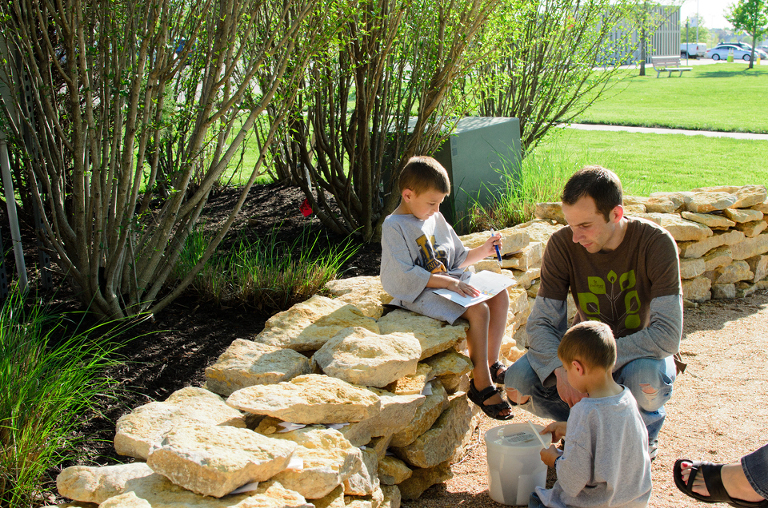 One of the final stations encourages people (adults and kids alike) to write/draw a prayer to God and stuff the paper into the rock wall, which is what Chase and Ty are doing with Nick here. 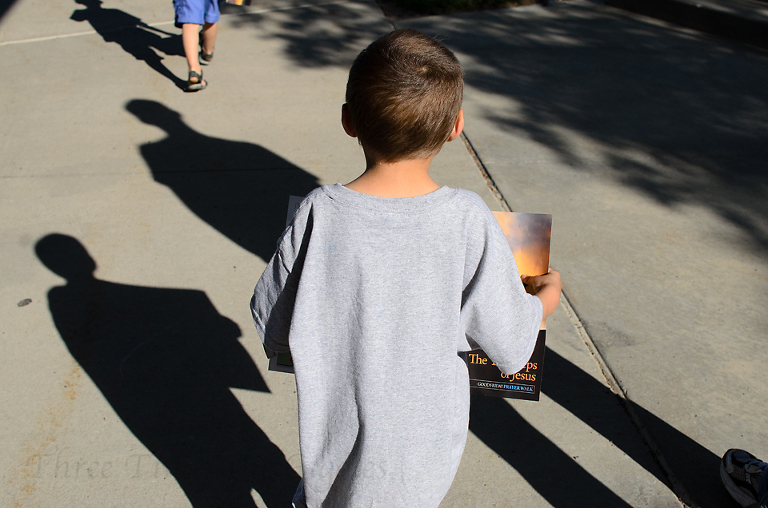 The Prayer Walk is a really great way to get ready for Easter and the boys love doing it each year! 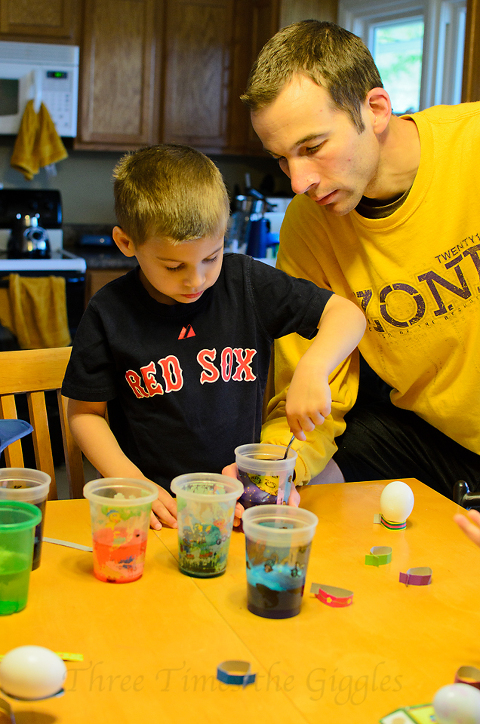 Saturday was kind of dreary and cold, so we thought it would be the perfect day to dye eggs! 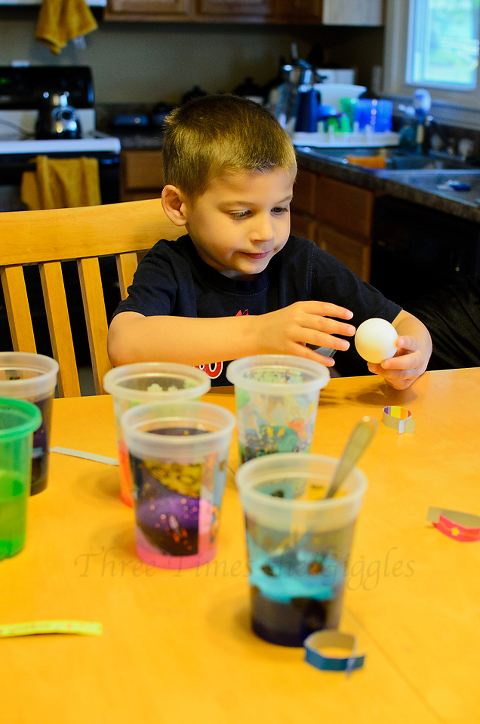 We’ve never attempted egg dying with the boys, as Nick and I both had nightmares about large cups of dye spilling off the table. The boys were all super careful with the eggs and dye cups, and I’m happy to report that not one cup was spilled. After we used a hair drier to dry the eggs quickly, the boys continued decorating them with stickers. Easter Sunday was a busy day! Nick headed to the church to work in the nursery for the 9am service, and then Nick’s parents watched the kids so that I could go volunteer for the 11am service. I love volunteering at our church on Easter! There’s so much excitement and chaos with thousands and thousands of people there (it’s estimated that we’ll have had approximately 20,000 people between the services Saturday evening and all day Sunday). The kids are all so excited (well, most of them – we did have a couple of criers) and dressed up and looking cute! Before I left for the church though, I informed the boys that they would have to find their Easter baskets. My parents always hid ours and I thought that was such a fun tradition! I remember one year (my brother was probably in junior high) we couldn’t find my brother’s basket until mid-afternoon, because it was so well hidden! The boys got a huge kick out of searching the house for their baskets, and an even bigger kick when I told them they could eat a Peep and the head off their bunnies, before breakfast. After I returned home from the 11am service, we had lunch and then sent the boys into our room with the iPad and Nick’s dad so that we could hide some eggs around the yard. They were all so cute, cuddled up in our bed, that I just had to take a picture. The last couple of years, we’ve basically “hidden” the eggs in plain view, but this year we made things a bit more challenging for the boys! Ty took the longest to find the eggs, mostly because each time he would find one, he would shake it and then have to open it to see what was inside. As a result of his lengthy process, he ended up having to find some of the most difficult eggs! Aunt Laura even had to lift him up to get one out of a tree branch! Little Miss Easter Princess! Lily had two Easter dress possibilities, so I had her wear one last weekend at the big egg hunt the kids went to and then a different one yesterday. Jackson saw me taking pictures of Lily and said “Momma, take a picture of me too!”. I love that he’s asking me to take pictures of him now! Yesterday evening we headed to church. I had hoped to take a picture of the kids, by the fountain, after the service, but we were paged at the end of the service because Lily had gotten sick in the nursery. Oh dear! It seems the illness was a fluke, because she’s fine today, but it means I missed out on the cute picture of them yesterday. At least I have a cute one from the week before!